Below you will find the transcript from the capital press conference yesterday. Reading closely you will see that the Democrats that spoke at the event opposed NMD but also endorsed TMD. MS. MOAVERO: Good afternoon. I'm Tracy Moavero, policy director for the Peace Action Education Fund. On behalf of Peace Action, Physicians -- Oh, the mike's not on? Where do they go on? -- I'm Tracy Moavero with the Peace Action Education Fund. On behalf of Peace Action, Physicians for Social Responsibility, Peace Link, Women's Actions for New Directions and the Global Security Institute, I welcome you here today. This is part of a three-day campaign and events where people have come from across the country, 35 states, to say no to Star Wars missile defense, no to a new arms race. On Sunday, over 500 people gathered in front of the White House for a rally which made the message clear: we will not risk the danger of missile defense. For the last two days, those same people have made over 100 visits to members of Congress with the same message. We represent hundreds of thousands in our constituencies across the country. MR. VON HIPPEL: Thank you very much. Defense Secretary Rumsfeld says that he's like the Wright Brothers -- maybe he won't get it right the first time, but let him try enough times and another different systems and maybe something will work. But there are certain consequences to the law of physics that have to be respected by any missile defense concept. Just like various ideas of how to fly, like putting on wings and flapping your arms. It didn't work. another illuminized balloon, and that simple ploy would increase the problem of the defense by a hundred fold. Now, for more than 40 years science advisors have advised presidents that because of such countermeasures, such possible countermeasures, a commitment to missile defense would result in a black hole in the budget. But presidents, when they are under political pressure, don't always listen to their science advisors. President Johnson ignored his science advisor when he made his decision to deploy a missile defense system. President Nixon fired his science advisor. President Reagan didn't ask his science advisor before he made his decision. And President Bush, the current President Bush, has come up with the most elegant solution of all, which is not to have a science advisor. Now, there are possibilities for getting around the decoy problem. One is boost-phased defense. If you shoot at a missile in the first few minutes, while it is still accelerating, you could destroy it before it could deploy these light-weight decoys, but you'd have to be within a few hundred miles, and that would not work against missiles coming from the interior of a big country like Russia or China. That's why the Reagan administration decided to go into space and had this grandiose scheme of having laser battle stations orbiting around the earth within the range of any possible launch point at all times. However, $100 billion would be just a downpayment on such a system, and on the arms race that would result. More importantly -- more important than the money, however, is the fact which the U.S. government officially acknowledged last year, that deploying a U.S. missile defense would make it impossible to persuade Russia to take its missiles off hair trigger, which is the biggest threat to our survival today, the fact that Russia has its missiles on hair trigger. Russia's military would fear that the U.S. might imagine that it could destroy most of Russia's missiles in a surprise attack and then be able to defend itself against the few surviving missiles with the missile defense system. So we would be doomed then to be on hair trigger indefinitely, and with a defense system that wouldn't work. Of course you may have noticed I mentioned a long list of presidents before President Bush who have made this decision to deploy missile defenses. None of those missile defenses were actually deployed. You can ignore the laws of physics for a little while, but not indefinitely, and after a while all of these proposals develop credibility problems which help lead their demise. Next -- are you going to introduce Rush, or should I? MS. MOAVERO: Go right ahead, go right ahead. REP. RUSH: Thank you, Frank. I am pleased to follow Frank von Hippel. There is no one in the United States whose ideas on arms control deserve more respect than those of Frank von Hippel. He has had a distinguished career looking at these matters, and we should take heed. And we are here this morning as scientists and researchers and policymakers once again to express deep concern about the Bush administration's pursuit of a missile defense which would result in scrapping the 1972 Anti-Ballistic Missile Treaty, which is based on the idea of "build first, figure it out later." And today the president is trying to sell his magical mystery shield to the Europeans, and they are not buying it, and we know why. The national missile defense, as proposed, as envisioned -- because it is only a vision at this point -- would not be effective. It would be costly to deploy, and it would be easily circumvented. bombs, pickup trucks and fishing trawlers. It would be billions of dollars down the drain. But it's not just a diversion of precious resources that could be used in other areas -- for health care, for smaller class sizes, for modern school facilities, for securing open space or taking care of America's veterans. It's not just a diversion from other activities that might really enhance international or national security, such as removing our missiles from hair trigger. MR. WILK: Thank you, Congressman Holt, that was really great. I am Peter Wilk, past president of Physicians for Social Responsibility. I am here today representing 20,000 physician members and supporters from across the country. As physicians we are deploy concerned about the public health threat posed by the 30,000 nuclear weapons still in existence around the world. President Bush has made clear his intent to radically shift U.S. defense policy away from reliance on deterrence and international treaties toward preparing the U.S. to fight nuclear war. 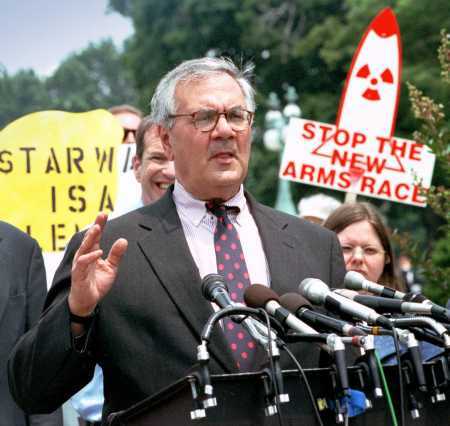 I suppose we can at least thank President Bush for putting the question so clearly before us: Do we favor wasting billions on a new version of Star Wars, on developing a new generation of nuclear war-fighting weapons and initiating Cold War II? Do we favor alienating our European allies and further provoking Russia to keep its nuclear weapons on hair trigger alert indefinitely? Or do we favor negotiating a bilateral agreement to take off hair trigger alerts to 5,000 nuclear weapons still on alert, poised to destroy all that we hold dear in this world? It's hard to believe that 20 years after President Reagan first introduced this misguided scheme that we are again faced with these kinds of questions. Back then we in PSR devised a simple way to illustrate the folly of the misguided scheme; that is, the Star Wars umbrella. (Laughter.) Would you want to go out in a rainstorm with an umbrella like this? (Laughter.) At best this is the reality of a missile defense system, at best 95 percent effective -- and you can see how effective that would be, which means of course enough nuclear missiles would get through to destroy our country as we know it, killing millions of Americans. I do feel fortunate to come from the state of Maine, where common sense generally prevails. Tom Allen, our Congressman, has led in a legislative effort to allow reductions of current loaded nuclear arsenals below START I levels, by introducing H.R. 2013, the Strategic Flexibility Act, for which we appreciate it. I am also especially proud of the wisdom and leadership he has shown in opposing the current reincarnation of Star Wars. And to that effect, to help make that point, we have collected 10,000 of these signed petitions from across the country, and have been distributing them yesterday and today to the appropriate members of Congress from those districts. The text reads in part: "I urge each of you to follow" -- and this is each congressman -- "to follow PSR's sound medical and policy prescriptions. Since there is no viability treatment for the effects of a nuclear attack, the only possible prevention is prevention. Please use your authority and power to stop nuclear danger immediately." REP. ALLEN: Thank you, Peter. It's very good to be here today with some of the hundreds of people who have come to Washington from all over the country with a simple message for policymakers here: The president's fast-track missile defense plan will make the world less stable. Rushing deployment of national defense will provoke other nations to increase their offensive arms and undermine U.S. national security. Abandoning arms control agreements and gambling on unproven missile defense technologies is unsafe and unwise. A national missile defense might be justified if proven to work reliably and consistently, and to improve our overall national security. But President Bush has offered no specifics. It's up to this Congress and the American public to demand answers to the questions that he has refused to address. One, can missile defense technology be proven to work reliably and consistently? Two, how much will it cost? Three, will a national missile defense improve our overall national security? Four, is NMD a proportional response to a credible threat? By spending too much money on missile defense, we really are likely to underfund programs to fight more likely threats from weapons of mass destruction, such as delivery by truck or boat or suitcase, not to mention other challenges like global warming, terrorism, crime and disease. The latest front in this ideological crusade is Secretary Rumsfeld's announcement of a plan to deploy five interceptors in Alaska by 2004, before testing is completed, before the technologies proven, before adequate radars are in place. And I believe that those who would characterize the Rumsfeld plan as a scarecrow defense have a real point. This "build first, ask questions later" approach is principally aimed at the ABM Treaty. It is premised on the inaccurate and misleading notion that the ABM Treaty prevents development of missile defenses. This second chart lists all of the missile defense testing on a range of systems that can occur under current treaty parameters. We can proceed to test technologies and have plenty of time to discuss treaty modifications with the Russians. Fiscal sanity and reality dictate that we fly before we buy, not the other way around. President Bush has previously stated that the U.S. missile defense system would protect allies as well as the U.S. I will soon introduce legislation to require the president to seek burden-sharing contributions from allied nations that are intended to receive the benefit of a missile defense system. It is only fair that if our allies want to play, they'll have to pay. MS. SHAER: Hello, my name is Susan Shaer, and I am executive director of Women's Action for New Directions, WAND, a national women's political organization, and a peace group. Now, WAND changed its name about 10 years ago from Women's Action for Nuclear Disarmament to Women's Action for New Direction, because we thought that the threat of annihilation was over. We knew the arms race with the Soviet Union was over. The Soviet Union was over. The trillions of dollars that we had spent on nuclear weapons was supposedly over. And we thought the country was going in a new direction. But we were wrong. arms race. We have been telling them in person. We have also been telling them through an email address, dontblowit.org. And we have been delivering to senators packets like this that list all of the thousands -- over 40,000 email messages that have come in in the last few days saying that these people are opposed to missile defense. We have over 6,000 signatures and 10,000 snail mail message, the old traditional way, that are coming in at the rate of over 1,000 a day. People all over the country are starting this movement, once again because we have to, and we'll be here every day and every week if we have to, hand delivering those messages to Congress. housing, Social Security, Medicare, but we don't even have enough money for our military men and women and their housing needs. We are going to change that. There is one good thing in Secretary Rumsfeld's announcement that planned to rush this to an initial installation in 2004 long before anyone will have any confidence that it works, and long before you can justify such an installation on irrational grounds. It bespeaks his lack of confidence that the Bush administration will be reelected. The significance of 2004 is to try to put some facts on the ground before a new election. It's an example of how unwise this policy is. Indeed, I am inclined to think that much of it -- that a cheaper way to achieve this goal would be simply to give in and build another monument to Ronald Reagan -- we have a couple -- (laughter) -- because at its base this is Republican obeisance to the Reagan legacy. It has very little to do with anything else rational. It is one more way of paying tribute to Ronald Reagan. And while I have not previously been in favor of additional monuments, I would think other expenditures would be cheaper and less destabilizing. Taken on its merits, this proposal deals with a threat that is at a very low level, and proposes to spend an enormous amount of money dealing with a very unlikely threat with a system that won't work. It has very little to commend it. What it will do if it is rushed into place, as Rumsfeld wants to do -- I guess they will unveil it at the Republican convention of 2004, will be greatly to destabilize the world. The Chinese will treat it as something aimed at them -- and indeed the administration has been wholly incoherent on the point about whether or not they should aim it at the Chinese. The president's announcement speech gave a clear impression that it was aimed at the Chinese. The Chinese will undoubtedly respond by increasing their missile capacity. So then will the Indians, who feel somewhat threatened by the Chinese missile capacity. And then so will the Pakistanis. So the only thing this is likely to accomplish is an increased incentive for nuclear proliferation. It will do it at enormous cost. And I will tell you when I go back to my district I am told that people are worried about not being able to pay for prescription drug, they are worried about drug-related crime in the public housing projects, they are worried about inadequate transportation, about unsafe bridges, about air pollution; they are worried about no being able adequately to house their families. Every single thing I have just mentioned is being starved of funding to pay for this very ill-considered idea. REP. TIERNEY: I'm not Barney Frank. (Laughter.) I am John Tierney, and I am here to add my voice to this. This particular administration has a policy that can be best described as ready, shoot, then aim. It has been this kind of policy whether we are talking about its unilateral claim against the Kyoto Protocol, saying that it was dead -- and now of course they are temporizing all their comments on global warming; whether it was their assertion that they were going to pull out forces from the Balkans, and now of course they are talking about cooperation with allies and making sure they don't unilaterally pull out; whether it was their expression of intent to not engage in the Middle East, and now of course they have two envoys there -- not one; or their talk about halting diplomatic initiatives in North Korea, and now of course they are talking about reaching out in engagement. And we hope that all of these reverses are of course real, and not just some semantical exercise that's trying to smooth out things while they're currently abroad. To date this administration's policies have been replete with "leap before you look" aspects. That has been true domestically, where we just passed a tax bill that was done before we took an assessment of what our needs and obligations are; and it's true internationally. And now this administration talks about deploying a rudimentary system of national missile defense before its been proven to be effective and before its been tested to have any feasibility. They're moving to full deployment and full construction before testing feasibility is proven. It looks like this White House is intent on putting the political horse before the technological cart -- putting the political cart before the technological horse, I should say. They have done this regard to not having any threat assessment; they have had no proportionality response assessment; they have failed to look at our military priorities and put them in the right order; and they have failed to really look at the prospects for diplomacy and for prevention. Just on the issue of feasibility, I want to call your attention today that this administration seems to be moving forward while at the same time trying to cramp a public debate about whether or not testing and feasibility have been adequately reviewed. After eight months, and at least six separate requests, the subcommittee of the Government Reform Committee has finally obtained an internal Pentagon study of the missile defense program. Now, Phil Coyle, who is the director of the Office of Operational Test and Evaluation within the Department of Defense appeared before that subcommittee last September. At that time I asked him if we could have a copy of his report. It was not classified. He said we could have a copy. There were no objections from the people from the BMDO, and we have waited since then and made request after request since then to get a copy of that report. It is only recently under the threat of subpoena that we got that report. But even then the report comes couched in language from the legal department of the Department of Defense that they do not want that disclosed publicly. And why don't they want it disclosed publicly? Because it talks about the potential dangers if this system is deployed prematurely. It talks about the failure in the testing program. It talks about the overstatement of technological progress and the potential of that system. There are serious deficiencies in that testing program. The internal study raises fundamental problems, the program is behind schedule, and it is slipping further behind schedule. The test program is severely deficient, failing to test basic elements of the system. The Pentagon after numerous failures actually altered the test program to make it easier. Despite that it has continued to fail repeatedly. The Bush administration is considering a crash effort to put into place a rudimentary missile system before the end of President Bush's term in 2004. It ignores the testing problems. It's virtually certain to waste billions of dollars by requiring some subsequent alterations when deficiencies do manifest themselves at the deployment. The system is immature, the study shows, and says that it is. It finds that no analyst can conclude that presently the system will work. It shows that it has an inability to defend against decoys, and that discrimination is the system's greatest challenge when it has not been shown to be met by that system. missile defense. All of the assertions that you heard earlier by my colleagues and others and all the people that are here and have written in understand that this national missile defense system ought not to go forward before all these questions are answered. I join all of you in making sure that we do just that: raise our voices and force this administration to come forward and prove that this system should in fact move forward and meet all of these burdens. MS. MOAVERO: As we have just heard, this program has been fraught with problems. That is why Peace Action, the largest grass- roots peace organization in the country, has launched the "Star Wars is Lemon" campaign. Over 300,000 postcards will be coming to congressional offices from constituents across the country this summer as taxpayers say no to this waste and no to the start of a new arms race. REP. FILNER: Good afternoon from San Diego, California, since I see a newspaper from my home town there. We have had the sentinel, we have had safeguards, we've had ABM, we've had SDI. And now we have NMD. Now, I think what the Bush administration is saying is that NMD means no more dollars -- no more dollars for health care, no more dollars for education, no more dollars for our prescription drug benefit for seniors, no more dollars for our veterans and no more dollars for our enlisted men who face a continually declining quality of life. REP. SCHAKOWSKY: I want to thank Peace Action, Physicians for Social Responsibility, Women's Action for New Direction, for working to put this important event together, and also to thank my constituents, the North Shore Peace Initiative in Evanston, Illinois, for coming to Washington this week, and for helping to spread a message with which I agree, that the -- this is what the groups say -- the national missile defense is a prescription for disaster. NMD is a program that is destined for failure on so many levels, and I stand here today with all of you in strong opposition to its deployment. crowds out a thought-out list of things that really are a threat to us and our planet and our security -- crowds out dollars for addressing those as well. And still the Bush administration is pursuing this irresponsible, unnecessary and unrealistic policy. I fear that moving forward with NMD will actually undermine our security by igniting Cold War II, and will reduce the diplomatic progress made over the last decade. I want to share with all of you a quote from Philip Coyle, who served as the director of operational tests and evaluations for NMD. He said, quote, "Deployment means the fielding of an operational system with some military utility which is effective under realistic combat conditions against realistic threats and countermeasures when operated by military personnel at all times of day or night and in all weather. Such a capability is yet to be shown practical for NMD." In plain words, this doesn't work. Now, it's important for that reason that we stop investing in NMD. But it's also important that we continue our work to help others understand that this plan is opposed by our allies as well as our adversaries, and could very well lead to a new arms race, making the United States a clear target for nations, building up their offensive arsenals in response to renewed perception of threat presented by the United States. MS. MOAVERO: Thank you to our speakers. Now the floor is open for questions. Any questions for our speakers? I see a hand back here. Q: Hi there. Sam McDonalds (ph) from -- (inaudible) -- magazine. Now, we have technologies that sink enemy boats and we have technologies that shoot down their planes and kill enemy soldiers that are coming across ramparts. Now, if other countries are developing missiles, should we not develop some defense to those? I mean, maybe not this one, but would the speakers look for something in that regard further down the line? And I am sure that many of these defenses that we have, such as an aircraft carrier, when it was first proposed, didn't work. And, as you know, they tried it quite a few times. But eventually it worked, and it's become an important part of our defense. So I am wondering if they ever envisioned a missile defense becoming part of the national defense system, and whether or not the fact it doesn't work now is really a solid reason not to try it. REP. ALLEN: Tom Allen here. Thank you for that question. I'd make two points. First of all, the system we are really talking about here today is a national missile defense system. Under the Clinton administration the administration was careful to keep separate a theater missile defense system to protect our ships and our troops overseas. That is a way to handle shorter-range missiles that are not traveling out of the atmosphere from a national missile defense. The Bush administration has lumped those two systems together, I think frankly to confuse the issue, and because they realize that although there's broad support in the Congress for developing our theater missiles -- it's almost essential to protect our ships and bases and troops around the world -- there is great skepticism about a national missile defense. When you look at the technologies, there are two major technologies related to a national missile defense system. One is the first effort of simply hitting a bullet with a bullet. We can't do that reliably and consistently today, but it's possible in my view anyway, speaking only for myself, that that system could be developed at some time in the future. The more difficult technology is how do you deal with countermeasures? How do you deal with balloons and other kinds of decoys that might well be fired with any missile that can carry a warhead, any ICBM that can carry a warhead across continents. That technology is probably much easier, but it's also unknowable. That is, we don't have a good way in my opinion to figure out which countries have -- you know, what the state of their decoy technology is. So there is a great unknown with any national missile defense system. But the most important point is this: It may be after extensive testing that at some point a national missile defense system would add to our global security. It may be that missile proliferation develops in such a way and our anti-missile technology develops in such a way that this would make sense. It's possible. But we're not even close to that, because this is not -- this push by the Republicans in particular, and by the Bush administration in particular as well, is driven not by the state of the technology, and not even, I would argue, by the state of the threat, which still remains a relatively minor threat. This is a faith-based initiative. This is a case where it's become dogma for certain people in this country that we have to have a national missile defense system, and so, regardless of what the facts are, regardless of the state of the technology, people are pushing ahead with it. And it's a mistake at this point in time, certainly. REP. EARL BLUMENAUER (D-OR): Thank you. I apologize for the delay. I was speaking on the environment on the House floor. And I guess that's the perspective from which I would approach this. I am struck by the disconnect between what we just heard from President Bush in Europe, where he is attempting to downplay our concerns about global climate change, where the overwhelming consensus of the scientific community is we've got a problem that is extremely serious, that poses a real threat to our national health, the security of the world in terms of destabilization, and yet we're denying the science. We're talking about more studies. We're equivocating, and we're abrogating leadership. MS. MOAVERO: Thank you. Let's pick up with the questions again. Q: Congressman Allen or anybody -- (inaudible). REP. ALLEN: Well, this issue is too important. I mean, the hundreds of people who came to this city from all over the country weren't sort of coordinating their visit here with the president's schedulers. I'm fairly confident in saying that. And this is an issue that requires ongoing debate, and particularly when the attention of the country and the attention of the world gives focus on this issue, among others, because this issue is clearly one which is important to our allies in Europe. They remain very, very skeptical, and I think for many of the reasons that we've outlined. MS. MOAVERO: Are there some more questions? Any questions for the speakers? Okay, we have one over here. Q: I just want to ask any of the representatives for their response. Do you feel that -- is it not true that Clinton put forth a policy where military grade of plutonium could be burned in civilian reactors -- (inaudible) -- ? From what I've heard, that's true, and if that is true, and assuming that it's true, I would propose that he has kind of set in motion the level to which Bush can go ahead and proceed to promote these policies that really affect 1) the environment, as the representative from Oregon has pointed out. And also to show the abuse of nuclear energy directly affects environment, and so on. MS. MOAVERO: Is it a question relating to missile defense? Q: Yes, because missile defense is -- will once again enhance nuclear use. REP. ALLEN: The Bush administration is responsible for its own policies, as the Clinton administration was for theirs. I think that's the only answer I can give you, that we're not looking back; we're looking at what's been presented to us today and trying to deal with the issue in front of us at the moment.